In an effort to drop a few lbs and increase my overall health I have cut carbs and sugar from my diet. I am not a big fan of "dieting" but I also know that as someone with PCOS and insulin resistance, minimizing any sugar from my body is the best plan for my homeostasis. But, who can resist the call of spaghetti and meatballs? The answer is no human being living in Southern New Jersey, that's who! So we are attempting some mock recipes to try and fill the (very large) whole in our hearts where pasts used to be. Clearly making your own is the best way to go. 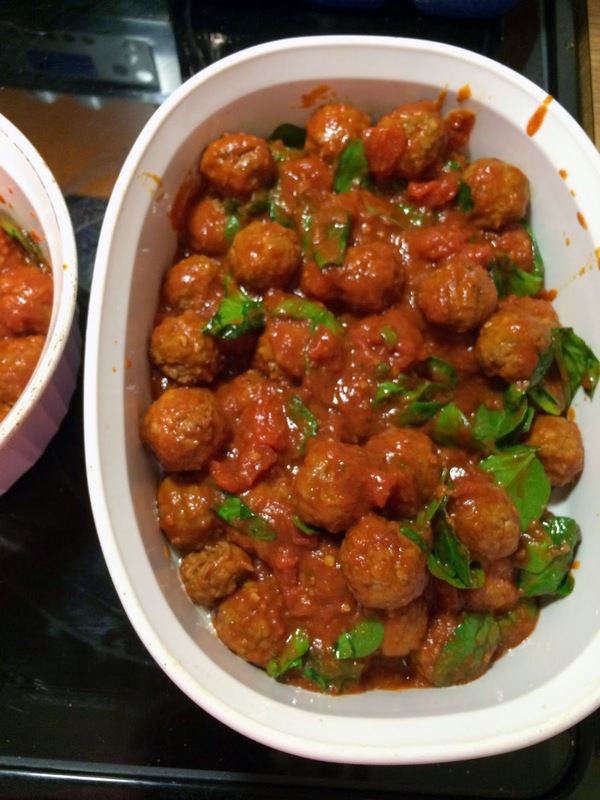 I however, took the easy route (since it was a basketball practice night) and use Trader Joe's frozen mini-meatballs which are egg and milk free. 1 Jar of really good tomato sauce. I used one I canned in the summer. Put the meatballs, sauce, pepper flakes and garlic in a crock pot. Cover and cook on low for 4-6 hours. Preheat over to 400 degrees. Prepare a 2 quart baking dish. Spread a layer of sauce from the crock pot on the bottom of the pan and sprinkle in some spinach. 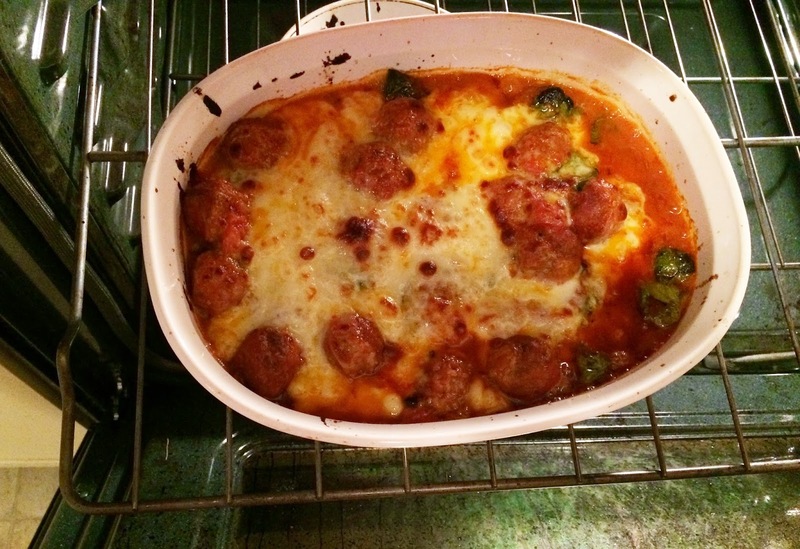 Top with the meatballs and remaining sauce. Top with spinach and give it a little stir. Top with the mozzarella and place in preheated oven. 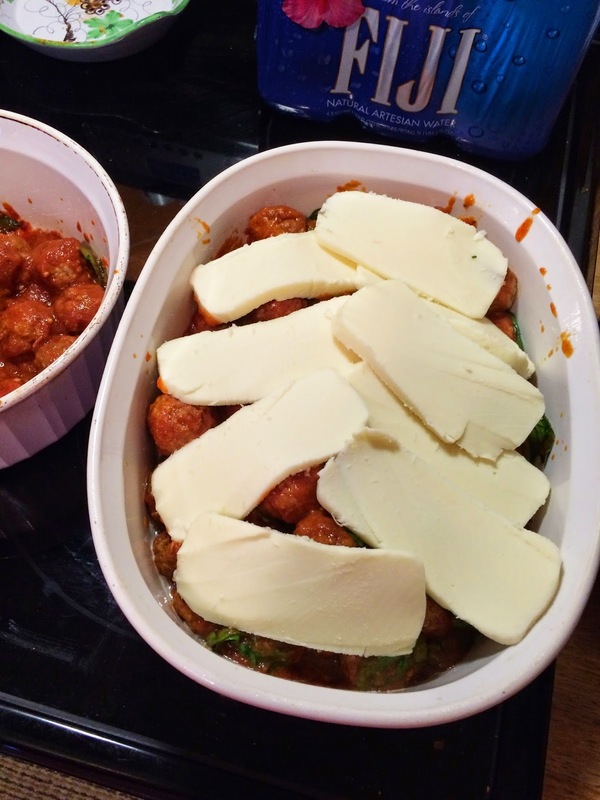 Bake for about 20 minutes, until the spinach is cooked down and the mozzarella is browned and bubbly. Top with torn basil leaves and parmesan. This was a truly delicious bake. It lacked a little something without the pasta or bread but you could certainly serve this with a nice crusty garlic loaf.